I must be coming up in the world of meat-oriented blogging, because I recently got three offers of meat samples. One was from a very well-known brand; I thought about this one, and finally decided that even if it represented their attempt to make a little higher-quality product, a laudable goal, it’s a type of meat I make myself, so what am I going to say? “This is better than their usual stuff, and still not a patch on my homemade”? I just decided I didn’t need to get into grading big time products in categories where I have a strong bias for the little guy and all he stands for. Especially when the little guy is me. Okay, bizarre as the concept is, it’s actually pretty good as jerky goes (and my son had just bought some jerky at Trader Joe’s, so I had a reasonable standard of comparison). Tender, reasonably good quality beef with a teriyaki flavor to it; certainly by the standards of gas station cuisine, it was of a much higher quality than Slim Jims or the like. The only hitch for me was, there’s no dosage information on the bag; I had no way of knowing if a whole bag was the caffeine equivalent of drinking a Coke, or if one little triangle would have my kids bouncing off the walls at 2 am. And it’d be all too easy to scarf a bag down, and then find yourself feeling ready to drive to Patagonia without sleeping. I would have guessed Berkshire by the look of it and I would have guessed the simple cure by the fact that it smelled exactly like the things I’ve cured following traditional cures, like guanciale and lardo— a musty salt smell leavened by a pine-forest note of the dried herbs. 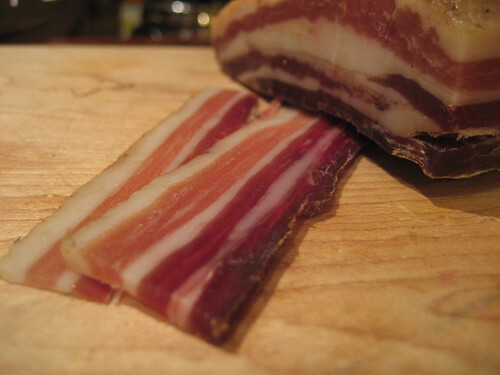 I often find commercial pancetta bland next to bacon, but this had a full pork flavor sharpened and transmuted by the curing process, denser with flavor (and certainly chewier) than the often limp product you buy. Unfortunately I’ve never had the La Quercia pancetta, so I don’t have a really stellar comparison, but it seemed to have all the virtues of its origins using superior pork, and of its handling with no modern shortcuts. 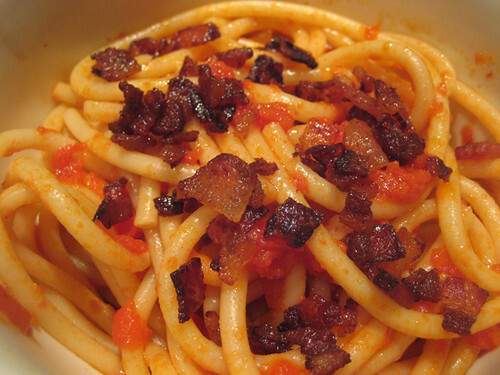 For the guanciale, well, there’s one classic dish that this cured meat figures in, bucatini all’Amatriciana. Hog jowl is an incredibly lush fatty meat— sadly, it’s a cut that’s often ruined during the inspection process (they slice through the jaw to inspect the glands) and discarded or sent for rendering. But barbecue places in the south will put it in beans, resulting in incredibly silky, fatty beans, and just handling it, it was like pork meat made with the best hand cream you ever owned. The last time I saw a pattern like that, little pink archipelagoes of meat in a sea of fat, was on a kobe beef brisket. I vaguely follow a recipe in Saveur Cooks Authentic Italian*, although it’s a dish almost too simple to need a recipe. 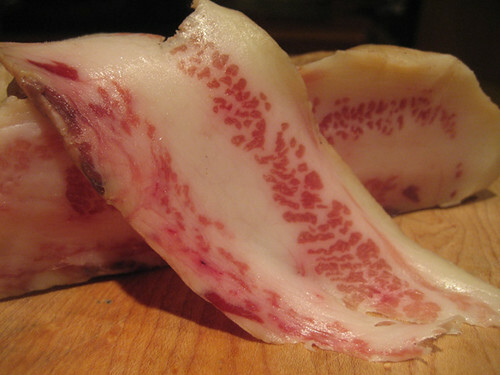 Interestingly, they say (copyright 2001) that guanciale is impossible to find in the U.S., and suggest various substitutes. How quickly things change: I’ve had access to no fewer than four different American guanciales lately. Admittedly, two of them were homemade (my own and Chuck Sudo’s). One key thing about the recipe is that, even though it still says guanciale, they clearly adjusted the quantity of meat upwards to produce the desired amount of cooking fat, because when I used 6 oz. of actual guanciale, I had a swimming pool of fat in my pan. 3 oz. will do you just fine. It’s a wonderful comforting dish and Bolzano’s guanciale brought it lots of lushness (in the sauce) and crunchy porkiness on top. So I liked both of the meats they sent me a lot— though it has to be admitted, these are fairly easy as cured meats go, hard to screw up at least once you’ve made the crucial decisions to spend the money on the best pork you can get and to cure it with no funny business. The real test, which I’m looking forward to immensely, is the speck prosciutto, which will be ready in April. Speck prosciutto is a particular style, smoked with rosemary and juniper— you may remember I linked to these photos of a speck plant high in the hills of Italy— and while it won’t be directly comparable to the La Quercia prosciutto (or their speck, for that matter), because it is a different style, it should have many of the same virtues of the longer curing time breaking down more of the proteins and making it all just that much more complex and umami-riffic. It will be a wonderful thing if these first meats from Bolzano prove to be the beginning of a serious artisanal cured meats movement in Wisconsin, comparable to the improvements in Wisconsin cheeses in recent years. 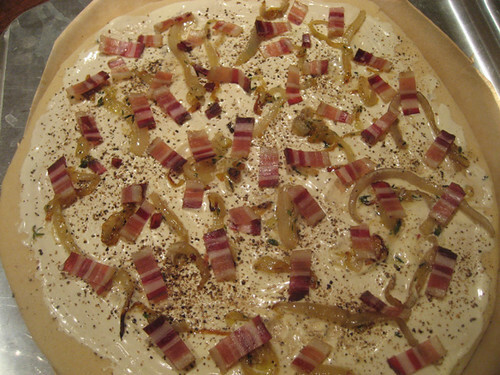 In the meantime, you can get Bolzano guanciale and pancetta at several places in Milwaukee, including the Wisconsin Cheese Mart and Glorioso Brothers, as well as at farmer’s markets in several Wisconsin cities. (CORRECTED: At this point, it’s only Wisconsin-inspected, so he can sell it via the internet to individuals, but not to retailers or restaurants who will resell it.) 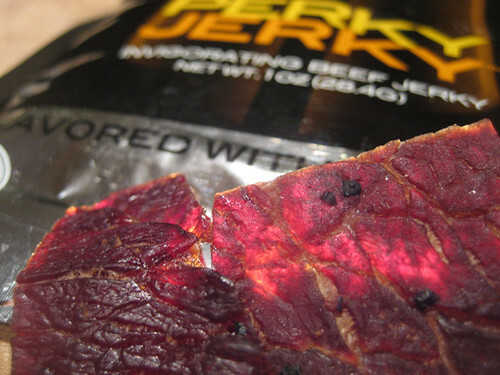 And Perky Jerky, I’m sure you can get that at several gas stations on the way up there. * Search inside the book for bucatini and you’ll find the recipe. 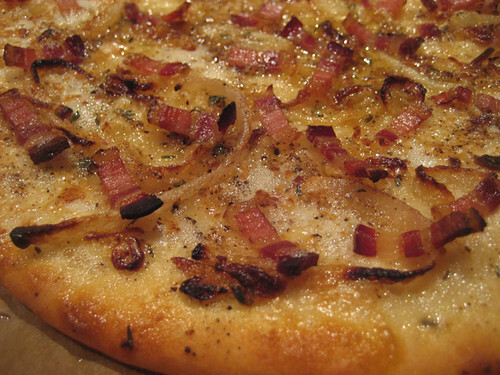 That pizza reminds me of the lunch I had at Hot Doug’s yesterday – Alsatian Bacon Sausage, topped with creme fraiche, carmelized onions, and Camembert. Now I don’t know what to have for lunch today after reading this. Bolzano’s rocks — I’ve bought several pounds by mail order since I’m too lazy to go downtown to buy it retail, and even sent some to my brother-in-law in California. Now I’m thinking about their prosciutto early adopter discount plan…. Tasty stuff, although I’m still learning how to cook with it — it has a strong flavor compared to “regular” pork products. The pancetta is especially good in the morning with eggs and toast; I microwave a few slices like bacon because I’m lazy, but pan-fried would be even better. Last night, I made creamed spinach with a little Bolzano pancetta thrown in, and it was incredible. That stuff is POTENT. Bolzano will have an online sale on their guanciale this Saturday, March 6–$7 per pound (which is half the regular price).